Yeah, some of the new remixes were pretty big misses from what I heard. The two you listed, especially Bullet Dance, were some of my biggest gripes. Plastic Night was another one. Ultimately I think the remixes will be a really mixed bag, with some being like Sword of Doom II and worthy replacments, and others just making me ask why they bothered. I just absolutely love this remix, and the original was one of my favourite Blazblue tracks to start with. And speaking of Blazblue Chrono Phantasma tracks the entirely new track Six Heroes Theme is awesome. Another post, another lot of BlazBlue musics. Atelier music, Spork? I have mind to direct you to my Ayesha post back on page 1 I seriously do believe that might well be the best OST Gust's done (that i've heard, anyway). [color=#339933]Atelier music, Spork? I have mind to direct you to my Ayesha post back on page 1 I seriously do believe that might well be the best OST Gust's done (that i've heard, anyway). I'll give that a listen at some point. If it's the best Gust OST then I'm in for a treat, as I thought Atelier Totori's was amazing. Not a single song felt out of place in context, and pretty much every one had a strong, memorable tune. Totori's does fit the game well, but it's not something i'd actually listen to outside of it though tbh. Not serious enough for you? What's your favourite track from the OST Jas? Mine's is probably this one. Its probably Miami disco as it reminds me of the film Blood sport, I do really like hotline by Jasper Byrne as well though. Right, I'm going to try and kick some life in to this half dead animal. So from now on once every week or two I'll post a track or two from non-Nintendo games, either arranged or game versions, of whatever I'm in the mood to post at the time. If anyone else wants to join in contributing that would be appreciated. I'll admit I'm more partial to the Kiseki Falcom music, but this was a favourite of mine from the moment I heard it, a nice and upbeat track for the penultimate dungeon of the game. Yeah, I'll chip in. I did three weeks back at the start of the thread, may as well pretend I didn't skip a beat. Also, that Ys track is mental - the beginning was like the start of a 90s rave song. 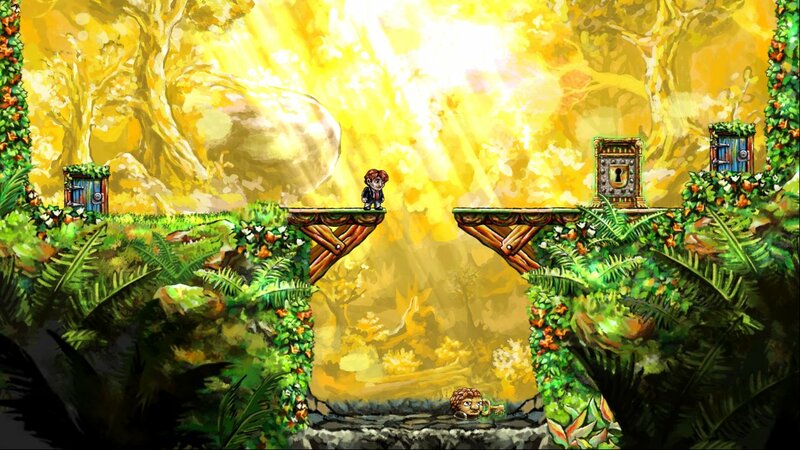 Braid is a gorgeous game. The story does stray into try-hard artistic wankery, but the visuals are lush, inspired by paintings and the music is a treat. Downstream is a lovely track that plays through World 2 (actually World 1: blame Jon Blow), and its gentle introduction serves as a gentle introduction to the game. Listen all the way through though - it gets fiercer towards the end. Long Past Gone is a track you'll likely not hear in its entirety playing through the game - it comes in World 4, where the gimmick is that time only moves when you do, hence your first listen to this will be jittery. It's a shame really, as this is brilliant - what starts out as an eclectic and bizarre track with its smattering of piano and strings becomes a melancholy track... just wait for the horns to kick in. The first time you hear Undercurrent, it'll be reversed. The reasoning for that is SPOILERS, but it's a great way of showing how music can be pivotal as a story tool. As you're playing through the final level, you're wondering why the music sounds off. The reversed version still sounds good, so it might not click it is reversed, just that it's a little...off. Eventually, you hit the rewind button and everything falls into place - with this tense track accompanying your revelation. The Braid music sounds a bit artistic-wankery too. Especially Long Past Gone. I forgot to do this yesterday as I was watching Person of Interest (awesome show), so here's this weeks pick a day late. I've no idea when this plays as Zero no Kiseki will likely never be released in English (then again never say never, I thought the same thing about Trails Second Chapter and yet it's coming) but if I had to take a stab I'd say somewhere near the end of the game, possibly the final dungeon. The name also sounds all final dungeony too. Yeah, I'm one day late too! Oops! That track doesn't do anything for me Athrun, seems just like a generic anime credits theme to me. Still one of the best RPGs I've ever played, Lost Odyssey was one of those rare Xbox 360 exclusives that made buying the system truly worth it. The visuals and story were phenomenal, and the battle system was solid, if not a little bit archaic. One of the true highlights of Lost Odyssey was the soundtrack composed by Nobuo Uematsu. Yeah - that guy. I'm almost certain that I've gushed about the map overworld music in this before. It opens so beautifully, the guitars and woodwind instruments complementing each other wonderfully, then eventually it explodes with power chords from electric guitars out of nowhere. It's brilliant. Dark Saint is boss battle music for a very important character in the game, and without spoiling too much, this plays during one of those unwinnable battles. It perfectly evokes dual feelings of "oh god must win this fight must win this fight" and "HOLY CRAP I'M SO SO SCREWED". Also, that recurring piano bit is so delightfully sinister. One of the interesting quirks in this game is how the main character, Kaim, slowly regains his memories. He does this through a series of optional typography-style stories, and they're usually heartwrenching. This absolutely gorgeous piano track accompanies a few of them, and even though it's reusued, I don't care. It's the perfect emotional accompaniment to Kaim's recovery from amnesia. Giving Falcom a rest this week I returned to my Final Fantasy XIII-2 original soundtrack earlier this week when I re-ripped the discs and fell back in love with some of the music from this game. The standard battle theme from the game, this is energetic, intense, and also does a fantastic job weaving one of the key themes of the game in to the song (Noel's theme to be specific unless I'm mistaken, the name is also a hint as to who the theme relates to). It is to me everything a standard battle theme should be, and one of many gems from the Final Fantasy XIII-2 soundtrack. Now, none of the games are good (I haven't even played Defiance), but I own all three albums and they're brilliant. Loved the music in both XIII and XIII-2. Might do my next music week (tomorrow!) on XIII. I'm pretty sure (off the top of my head) that the chap who composed the music in SOCOM 4 also did the music for The Walking Dead. Bear McCreary. He actually did all three games that I mentioned. I'm a big fan of his music (hence why I bought the Defiance soundtrack without paying much attention to the game). I'm hoping he gets the chance to work on a big game, but he seems a bit busy at the moment with The Walking Dead, Defiance (TV show), Da Vinci's Demons, Agents of SHIELD and Black Sails. Instantly loved this song when it appeared during one GTA 5 mission.